I wanna talk about modern movies that might be better in B+W. 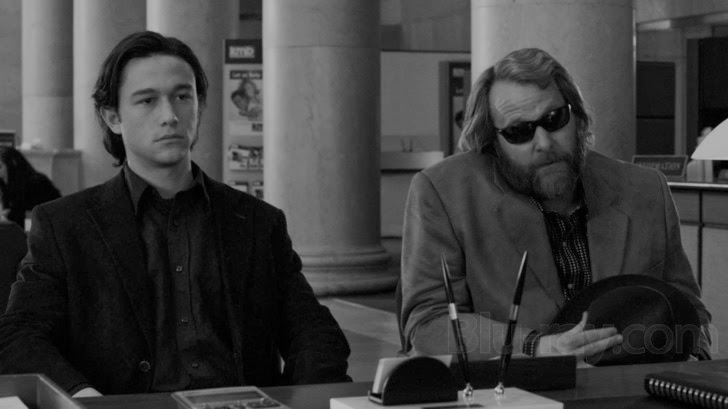 I recently read an old article discussing 10 modern flicks that would work great in B+W. The list is tight – watch the RAIDERS OF THE LOST ARK clip and tell me it’s not better in B+W. They also list THE LAST SEDUCTION which will always win my heart. Now, if I ever have the chance, I want to watch some other flicks in black and white. I wish I could make some clips up now, but I’m a fool when it comes to this sort of rad stuff, so instead I’ll purely list some titles with some chatter – and I’ve done a few pics because I love you all so much. I hope you dig. 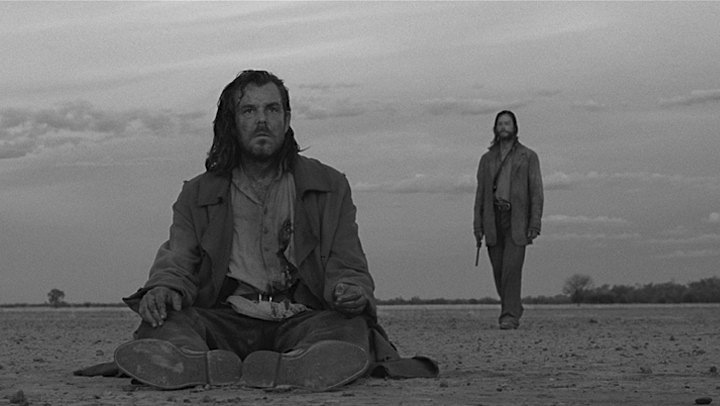 THE PROPOSITION – this Aussie western noir is possibly the best flick this country has ever produced. It is damn good. It’s shot with some amazing colours – all drab and moody – but I’d love to take a stab at it in B+W. SE7EN – this seems like a no brainer. The flick is already so rainy and nasty, but as a B+W, man, that mood would just drop. CAPTAIN AMERICA: THE WINTER SOLDIER – This is more an experiment than any sort of guarantee, but I think it’d change the impact of the violence and the tone of the piece and the whole would come out even further grounded and dark. I mean, look below, that’s pretty tight, right? INCEPTION – maybe this would work. I’d certainly be down to see it try. ENTER THE DRAGON – I actually don’t think this would work, but I am all down for trying. Who knows, right? BODY HEAT – I had to pause and reflect on whether this already is B+W but it’s not, and it totally should be. PONTYPOOL – the visuals run second fiddle to the sound on this one anyway, so why not mute them? Make this underground radio station really feel claustrophobic. 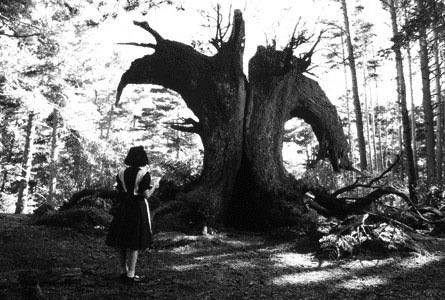 PAN’S LABYRINTH – del Toro shoots with such certainty and passion that’s it’s difficult to suggest altering his vision but look at the photo below, tell me this wouldn’t work? THE EVIL DEAD – another I had to wonder if it wasn’t already B+W. Low budget, one location, spooky jumps – this would work for B+W so well. MILLER’S CROSSING – this film feels like it would work, so I’ll give it a go, but there is uncertainty in my heart. VIDEODROME – there has to be a Cronenberg in this bunch. I think this would take on a more weary bleak tone in B+W and that would be just fine. BRICK – bit of a gimme really. An obvious choice but one that would be so cool to see. 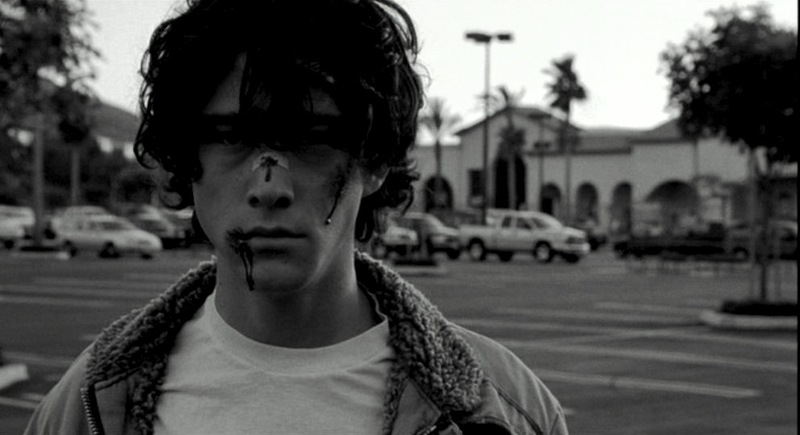 THE LOOKOUT – an oft forgotten gem from Scott Frank, The Lookout is a twisted weird heist flick, and it would only bury deeper into itself with this lack of colour. 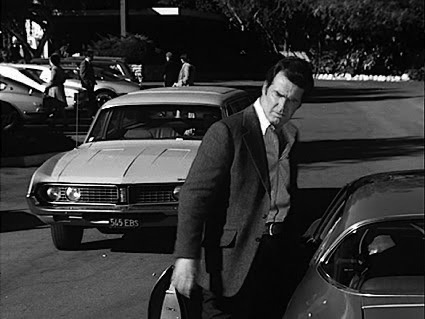 THE ROCKFORD FILES – I would watch all of this. I’d be interested to know your suggestions for some B+W flicks (or TV). I know, for me, thinking of B+W TV reminds me of watching old midday movies with my mother, old Hitchcock flicks, old moody pieces that shaped my pre-teen years. Just looking at the B+W pics above stirs a response in me. I love B+W flicks. I wish I had more time for them. Some stuff I read, probably on my phone, while dealing with slow IT or a sleeping child. 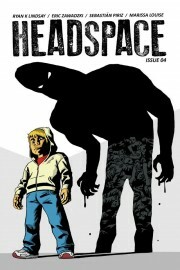 HEADSPACE #4. Our best issue yet. The final pages will knock you for six. “Shane comes face to face with the twisted black heart of Carpenter Cove, and watches it win. Max finally tracks down the lady who started this whole mess and she says something he can’t ignore. Spread the good word, get ready for fun, and thank you eternally. Some stuff I’ve been reading. You might dig. THE TOP 25 JASON STATHAM FLICKS – because you know you love them, and because you might have missed on. Catch up now. POST-SDCC LAY OF THE LAND – It’s a BC article but it’s the kind of peek behind the curtain that tells us so much about the comics industry and how it really goes at different publishers. The sort of thing you need to read, if you are breaking in, but always keep a few grains of salt nearby. WE ARE THE CANDY BARS OF POP CULTURE – in Which my good friend Julian darius exposes himself a s a Major League Fun Buster while reflecting on GUARDIANS OF THE GALAXY. My 2c: I loved that flick, and yet I know it’s dumb, but enjoyable over smart is often a path I’d rather take. The opposite – smart but not enjoyable – certainly holds few merits. DREAM THIEVES – I’m not even sure what to clarify this as – it’s about a US ban on sleep – but I dig it. Aw, yeah, we got there. And in 24 hours, to boot. And we are still going. Cannot thank you enough for the RTs and water cooler chatter and your hard earned money slapped down for a product we believe in. Now, what next? Well, no reason to close up shop and go sip mint juleps in the shade just yet. Let’s roll out some rad STRETCH GOALS! $1250 – PITCH PROCESS – get a free download of a pitch I did for A LOVE SUPREME, a book about a Doctor Strange type hero who is defeated in battle but uses the power of love to save her consciousness and insert it into the mind of her boyfriend with him. Then, four months later, they break up, and she’s still stuck in there. This download is aimed at those process junkie types who wonder how to assemble and structure a pitch. Which can be hard when you can’t find many to look at, so here will be the whole thing. $1500 – COMIXTRIBE SAMPLERS – I wrote short stories for the OXYMORON and SCAMthology shorts at ComixTribe and you can get handy DRM-free PDF downloads of both stories, one with Daniel J Logan art, the other with Adam Masterman art. 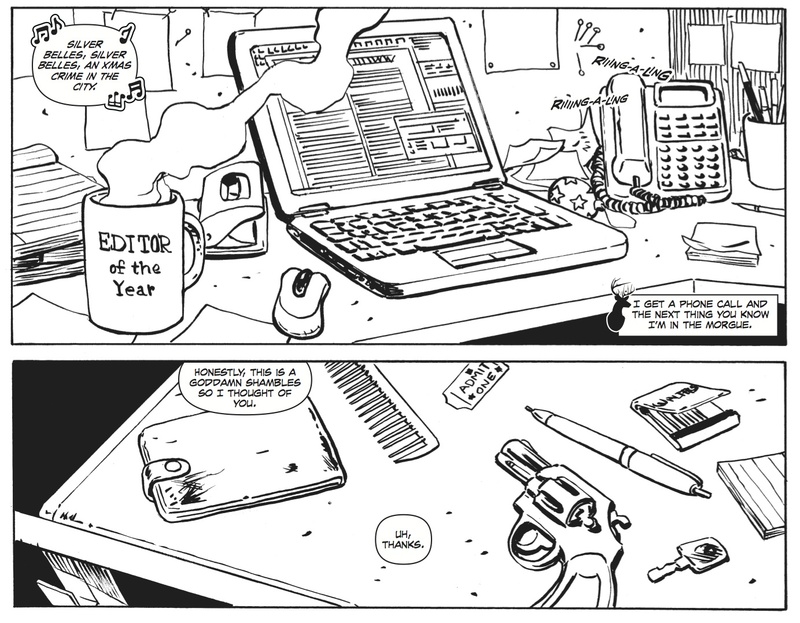 $2000 – GET LOVESICK – a while back I got to place a 5 page comic short into the back of an Image comic. The short was LOVESICK – with Daniel J Logan art, Jordie Bellaire colours, and Ed Brisson letters – and it ran in the back of GRIM LEAPER #2 by Aluisio Santos and Kurtis J Wiebe. It’s a nasty short many wouldn’t have seen before, so I’m dropping it here as a bobbing lure of a DRM-free PDF download. $2500 – ANTLER PROSE – if we hit this goal, I’ll add a short prose story to the BROADSHEET PDF (yes, I wrote prose, too, I’ve even been published by Crime Factory). I’ll be sure to make the short nasty twisted fun. $3000 – CURRICULUM #1 – I’ve been busy squirrelling away at a new property called CURRICULUM, along with my writer’s room of Dan Hill, Ben Rosenthal, Grant McLaughlin, and Danny Djeljosevic the Destroyer, and artists like Sami Kivela, Daniel J Logan, Elsa Charretier, Bryan Coyle, and more. It’s a tablet page sci fi periodical about an intergalactic class that ends up lost on the other side of the universe and must find their way back. The first issue is written by me, illustrated by Sami Kivela, coloured by Marissa Louise, and lettered by Nic J. Shaw. If we hit $2.5k I’ll give it out as a DRM-free PDF download – which means you’ll get the first issue well before the title actually launches. Yep, that’ll get us started. Help us out, spread the word, and let’s see what magic we can weave. The DEER EDITOR Kickstarter has begun. 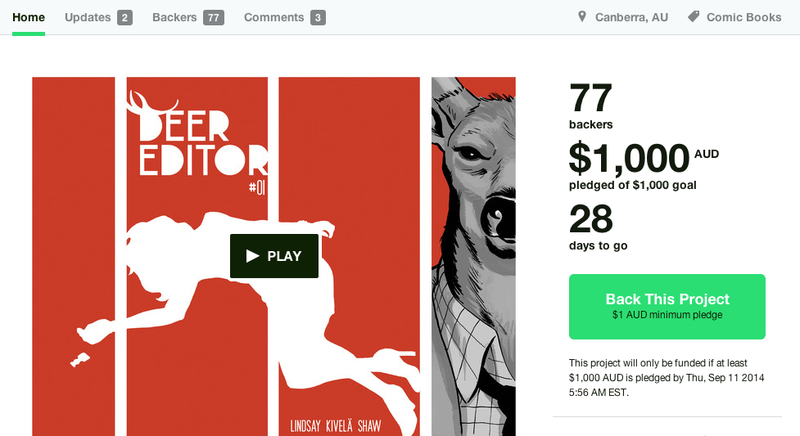 $1k goal, $1 PDF, 1 whole mess of noir and journalism and antlers. I really hope you and maybe 200 of your mates dig on this. I am superexcited to bring this issue to the world. Sami Kivela and I began the journey of DEER EDITOR waaay back in 2013. Now, it is ready. I couldn’t do any of those if we just launched on ComiXology Submit or through micro-distribution. We wanted to do something different and we think this campaign has lots for all sorts of different people. If you dig the campaign and the book, back it, natch. But if you don’t 100% dig it, or you’re strapped this month, then that’s no problem, but considering passing the campaign link through the usual social media crab nets in case someone else might dig it hard. Indie comics always live and die on the vine based on word of mouth so we thank you in advance for sending up a little flare in your sphere of influence and passing along our tale. We’ll be around for the month. We’ll be aiming to deliver downloadable fun as we hit milestones towards the goal, and maybe even a few cheeky stretch goals. Hit the campaign up, scrub through what we’re offering, and we hope you find something you like. 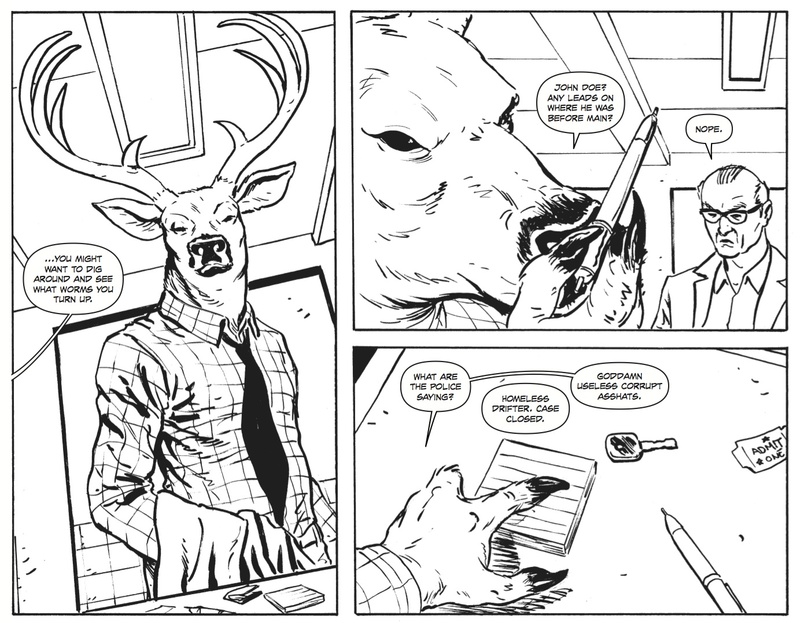 DEER EDITOR 2014 – you’re favourite new B+W tablet digital comic all about crime, journalism, and antlers. 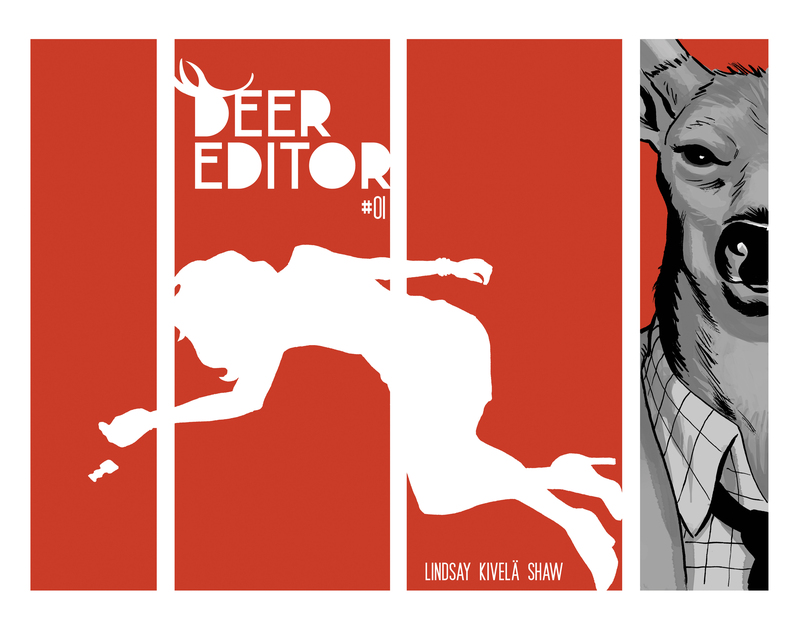 DEER EDITOR – a tablet crime comic about the editor of the crime beat who’s also a deer by Sami Kivela, Nic J Shaw, Dan Hill, Christopher Kosek, and myself – launches on Kickstarter in under a week. I dropped the main beats on that earlier this week – click through for the downlow, the basic book pledges, and a preview of some pages. Ryan will record the entire issue as a ‘radio drama,’ with audio files sent to you. Comes with BROADSHEET PDF + RKL SCRIPT PDF. Dear lord, I’ve been wanting to do this for years. Now, take into account, this won’t be some slick production, but man alive is it going to be fun to do. I just hope I have the voice to carry such an activity. The SFX from my mouth might seem suspect at first but I’m certain they’ll win you over. For me, this is the heart of this campaign. If you’re looking to really support with your money and get something rad in return, here it is. Enjoy. To listen to a sample of what the radio drama will be like, check this video here. I am crazy excited to do this. It could end up terrible, who knows, but man alive it’s going to be fun. I really hope people dig down on this one hard. Keep up with the story, don’t get gored. I dropped the main beats on that yesterday – click through for the downlow, the basic book pledges, and a preview of some pages. That’s right, TWO PDFs. One is the BROADSHEET PDF, and the other is the RKL SCRIPT PDF, feat. scripts of MANY of my other projects. HEADSPACE #1-3 — THE MANY HAROLD HOLTS OF SPACE AND TIME — LOVESICK — SURVIVOR — My shorts for the OXYMORON +SCAMthology books from ComixTribe — JONBOT V MARTHA – the guest one-shot strip I wrote for the SICBA award winning Colin Bell and Neil Slorance’s webcomic — LITTLE MAN IN THE BIG HOUSE #1 – a short story about a prison for supervillains that is in the works — YELLOW – a short story I have coming soon — CAPTAIN HUMAN THE ROBOT, both the All Ages Edit and the After Hours edit — CURRICULUM #1 – a forthcoming sci fi tablet periodical — and a few other projects, as well as whatever else I can find floating about that isn’t terribly embarrassing. It’ll be worth easily over 200 pages. I love reading comic scripts, they certainly help hone my own writing, so I hope some process junkies out there really dig on this beast of a package. I know I have pretty much every script available to download online so I’m always keen to see new stuff pop up, I hope you are, too. And it’s been fun to read through these old time capsules of my talent (imagined, and nascent, and never quite real, ha). This PDF is going to be monstrous, and if you like it, you’ll love it. You also get a peek at things coming down the pike, so that’s exciting. You’ve got yourself under one week to get excited, tell your friends, ask me questions if you want, and generally bring the ruckus. We launch next week, on Monday/Tuesday (depending on your relationship to the international date line), and will run for a month. All updates will run here, some updates will run at the DE HQ, deereditor.tumblr.com. Tomorrow I’ll run details of a high end pledge level, one of a kind, some original art. DEER EDITOR is a 48 tablet page one-shot which you are going to need in your life. With art from Sami Kivela, letters from Nic J. Shaw, edits from Dan Hill, and words by Ryan K Lindsay, this book is dark and strange and completely what you want. Bucky is the editor of the crime beat at The Truth. He’s also a deer. This journalistic crime story starts with a John Doe killing and drags Bucky down into a world of political intrigue, a wi-fi enabled grotto, and a station locker full of a story bigger than he thinks he’s tackling. If you dig CHINATOWN, ALL THE PRESIDENT’S MEN, or TIGER LAWYER then this gonzo pulp fu anthropomorphic slice of crime and words is absolutely a must for you. This issue works as a one-shot story, but there is also room to build many more stories with this fantastic character, and I will get to them in time (the next one is already scripted). DEER EDITOR will be coming to you on Kickstarter next week as a digital only campaign, where we’ll be selling PDF versions of the book. We are going digital only because it’s something we believe in, but it’s also the most realistic given my Australian HQ situation V international postage. I am not keen on charging large on anything in this campaign. Light price points are a firm stance from me so I’m putting my money (your money) where my bearded mouth is. $1 will buy you the TABLOID PDF – wherein you’ll find the entire issue. 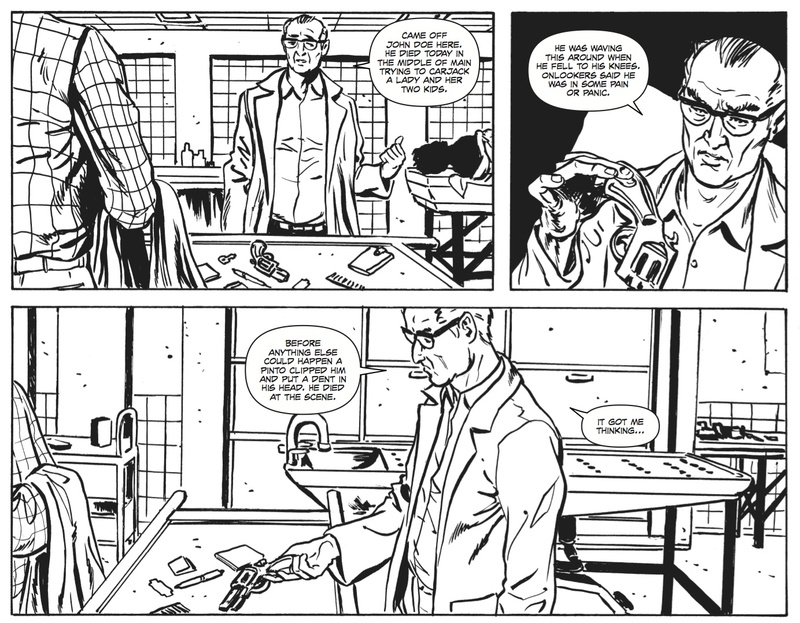 $3 will buy you the BROADSHEET PDF – wherein you’ll find the entire issue, as well as back matter, sketches, pin ups, design prints, and the full script of the issue in over ~115 pages of crime comic/process junkie goodness. This campaign is to get the creative team paid. Sami Kivela worked his genius fingers to the bone on this book and he got some money but I want to see him riding a space yacht to go get crunk on one of the party moons of Jupiter. I also want to get some scratch for Nic, Dan, Christopher, and myself. I also really dig Kickstarter as a tool to reach out to a new audience and get that profit straight into the hands of the creators with minimal slices taken by others, and also proving the project viable so we can continue it in some manner. You’ve got yourself one week to get excited, tell your friends, ask me questions if you want, and generally bring the ruckus. We launch next week, on Monday/Tuesday (depending on your relationship to the international date line), and will run for a month. Some updates will run here, all updates will run at deereditor.tumblr.com. Tomorrow I’ll run details of the next pledge level, the RKL SCRIPT PDF. We hope you’ll run with us because you can’t chase down a story walking.